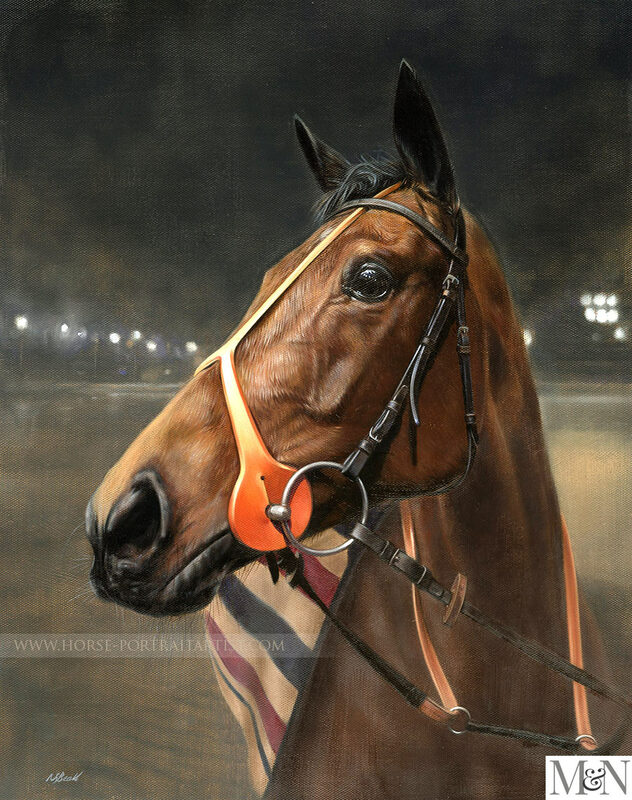 Mark Goddard, UK emailed us in 2014 to enquiring about a race horse portrait. Mark wanted to commission a portrait which was to be a a surprise gift for his wifes birthday. 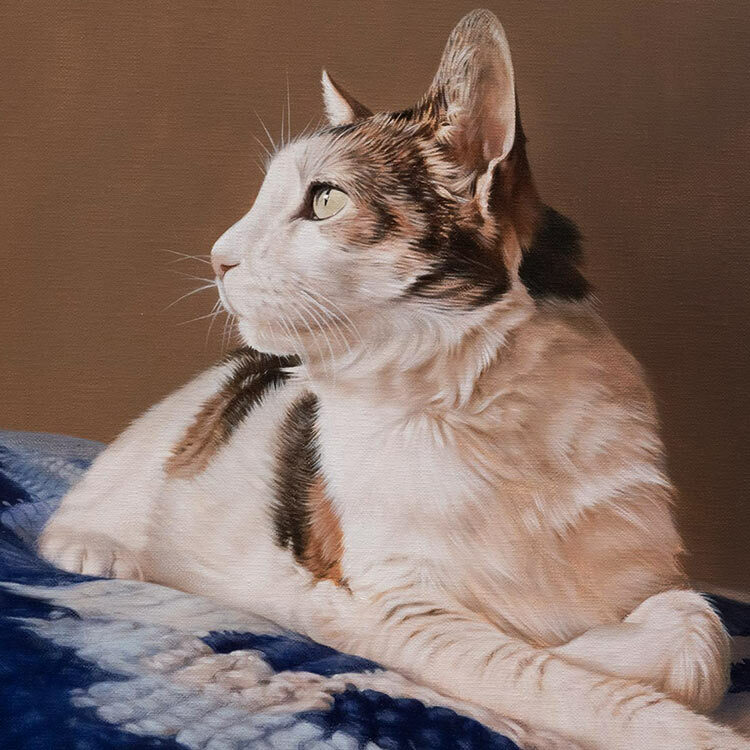 He only spoke and emailed us from work so that he could keep everything secret and requested the painting to be in oils at 20 x 16 in size on Italian linen canvas. Mark had a few good photos of Amosite however want him to be shown wearing a different rug with a particular stripe on, so Nicholas used other photos to be able to do this. I feel that Nicholas has not only captured Amosite well, but has also captured the feel of the evening when the photo was taken at the racetrack - the slightly misty and cold but exciting event with bright lights and hustle and bustle of being there. The natural colour pallet Nicholas has used here is exceptional. Mark opted to use our framer and I have added some photos below of the portrait when it was back here in the studio. Both Mark and Claire were extremely pleased with the portrait as you can read below. Claire absolutely loves the painting! Thanks very much, looks great in the frame too! Wow! Looks great! I really think it captures the character of the horse & the alertness of her in the photo. Magic hands, Nick! Thanks very much- my wife is going to love it! 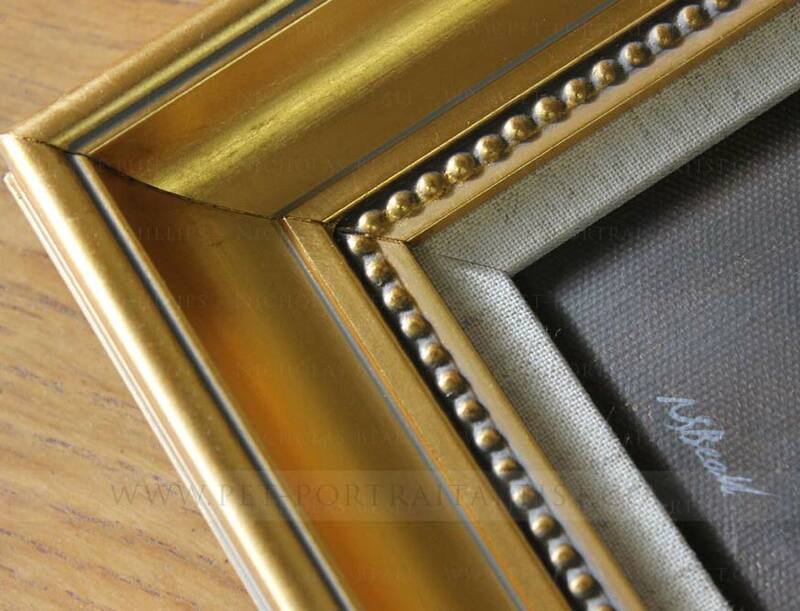 As you can see from the photos below we had the portrait of Amosite framed with our local framer. This particular moulding is now discontinued ho0wever we have access to many more mouldings very similar! All of our frames are made bespoke for each client. They can specify what type of frame they are looking for and we can always find something suitable for them. 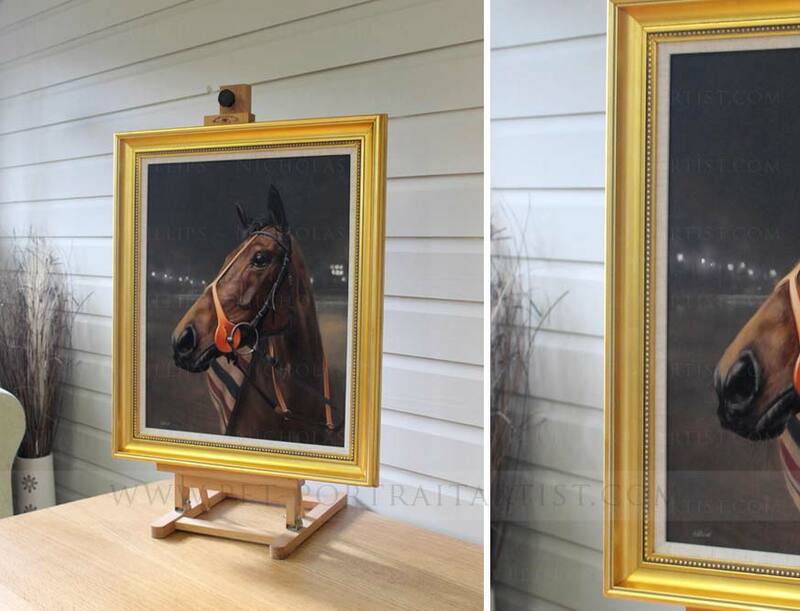 Why not have a look at a few of our more recent frames on our Horse Portraits Framing page. 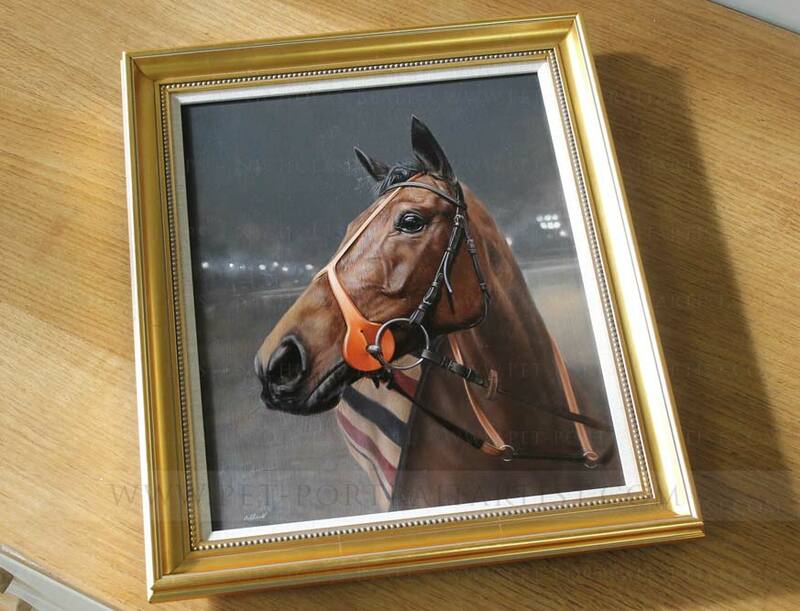 We hope that you have enjoyed reading about Amosite's Race Horse Portrait. 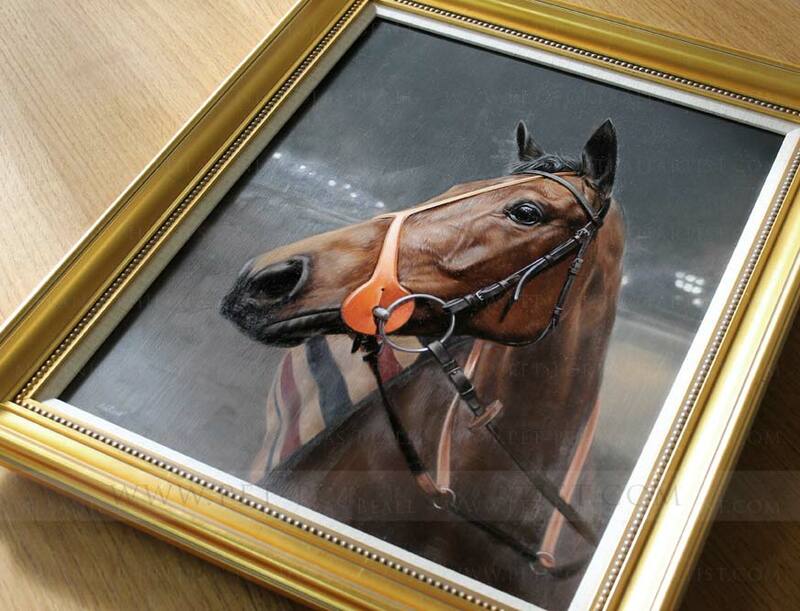 If you would like to commission a portrait similar to Amosite's, you can email us your photos at any time. Let us know he kind of portrait you are looking at having and we can advice and help you inn any way we can. 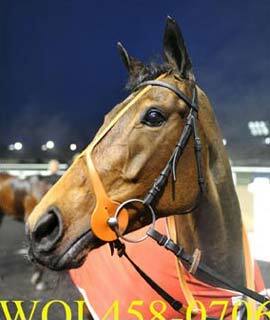 Email at any time from our Horse portraits contact page.